Billy the Kid: Tennis, anyone? Okay, so even the New York Times published a story about another possible photo of New Mexico’s most over-appreciated celebrity, Billy the Kid, but I’m still waiting for the shot of him and other Lincoln County gunmen in tennis whites. 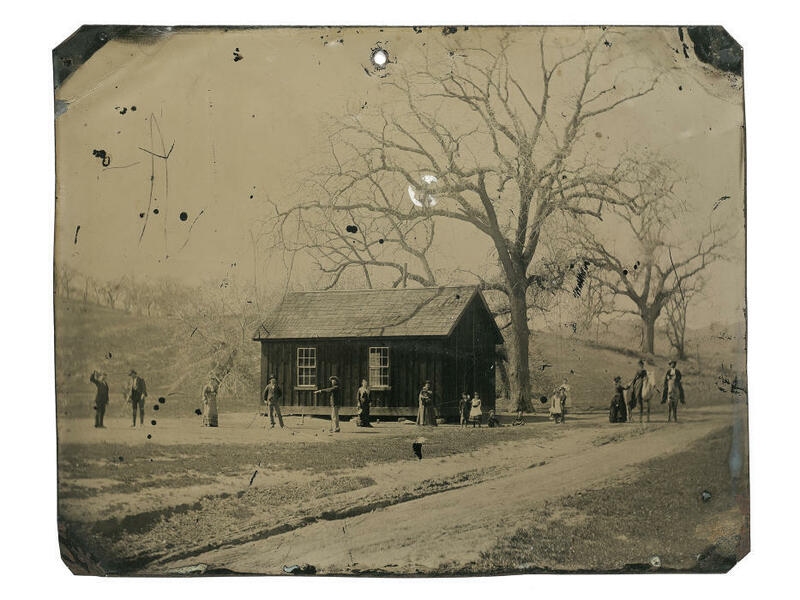 The value of the latest tintype may go sky-high because experts say the photo, for undetermined reasons, includes Pat Garrett, the Kid’s eventual killer. Billy has been identified, in part, by the size of his Adam’s apple. Provided to The Associated Press and New York Times by owner. 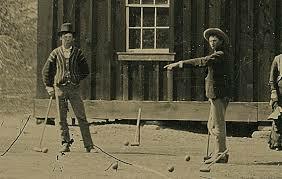 As for my continuing research on 19th Century New Mexico outlaws and lawn sports, you will recall that the last famous Kid photo showed Billy and the Regulators playing croquet somewhere in Lincoln County in 1878. This might not be surprising given that the gang had recently been employed by Englishman John Tunstall, a rancher and merchant who was the first of many to die that year as the result of Lincoln County commerce. Meanwhile, lawn sports also were in a kind of ruthless transition. In the croquet photo, Billy was dressed in a natty sweater, one that might have gotten him into the All-England Lawn Tennis and Croquet Club had it not been for the dusty boots, scroungy pants and cockeyed hat. To say nothing of extra balls apparently stuffed in the sweater pockets and a firearm possibly concealed behind his back. 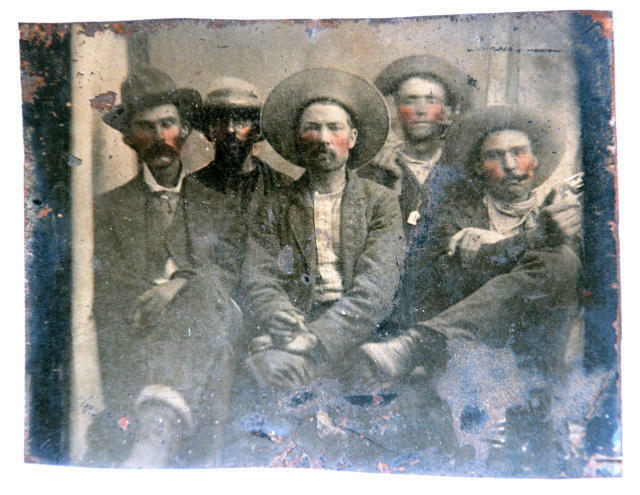 And in the new photo, likely taken after the outlaws-playing-croquet feature was shot in 1878, Billy, second row and second from the right, has changed hats and is wearing what might be construed as a precursor to the tennis sombrero. From Kagin’s, Inc., as shown in numerous publications. One can only assume that New Mexico noses soon would be sniffing at croquet, too. Thus, I await a tennis-era portrait of the Lincoln County Bushwhacking and Lawn Sports Club. 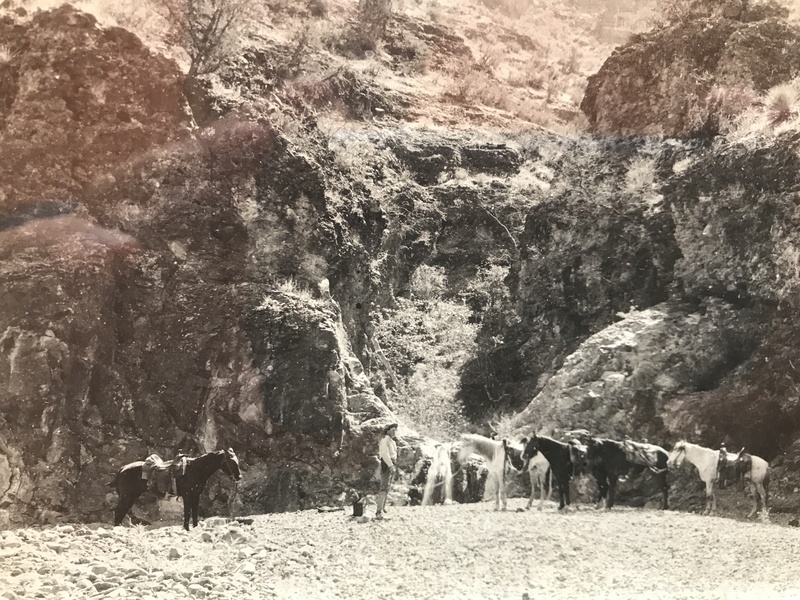 As for the faded photo of the lone cowboy below, it is mine and I have begun to wonder if it might be among those exceedingly rare and valuable photos of Billy the Kid. I cannot, however, see the size of the cowboy’s Adam’s apple, and verification remains elusive.